CCTV Camera Pros tests the PIR-IR60 hidden IR camera to see if the 940nm LEDs are truly undetectable by using an iPhone and recording surveillance video footage from the IR60. In this video we're going to test to see if the infrared LEDs are truly invisible and undetectable on this hidden spy camera. This video was actually inspired from a question we got via email from a customer. The customer's name is George and he writes: "Thanks for taking the time to create the video for the PIR-IR60. It looks great. I have one question for you. If you point your camera/phone at the IRs built into the illuminator at night, do you see a white glow on your phone which would give away the location of the camera?" Thought that was a really great question, and I was 95% sure that it would not give away the glow, but we wanted to test to be absolutely sure, so here's the video that we made. I'm going to use my iPhone's camera to try to detect the IRs on the PIR-IR60. It's mounted up there in the corner of my office. That's a little mounting structure I use to test cameras. I have my iPhone stand here on my desk so we'll get it positioned pointing up towards the IR60. You can see it gives a nice color with the lights on. Turn the lights off and the IRs are engaged. You can see me clearly in the dark, but you can see on the right the iPhone pointing directly at the camera does not detect any glow whatsoever. The IRs are completely invisible. Just let that run for a second or two and I'll turn the lights back on. The IR cut filter is disengaged and the camera goes back to color mode, and test complete. The reason why the infrared is not detectable on the IR60 is because this camera uses 940 nanometer wavelength IR LEDs. Traditional IR LEDs use the 850 nanometer wavelength, which omit a red glow. The 24 IR LEDs on the PIR-IR60 are concealed behind what appears to be the PIR sensor window of this camera, which makes them completely undetectable, is one of the reasons why the IR60 is our bestselling hidden spy camera. 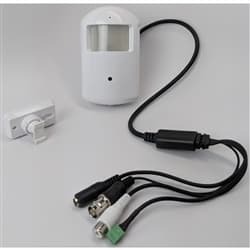 For more information or to purchase the PIR-IR60, please visit www.cctvcamerapros.com/ir60. Thank you for watching.